I should admit I'm not much of a fan of retcons. A retcon is a story that either shines a new light on the history of a character - or completely changes something about that character's history (all while staying in the boundaries of accepted continuity). It's certainly possible to do that kind of story well. Frank Miller created Elektra, a character we'd never heard of, made her Daredevil's former love interest and ended up with a terrific story. It added to that hero's history. Over in Iron Man, they crafted a long, involved story that revealed that Tony Stark was the adopted son of Howard and Maria Stark, a story designed only to shock the reader. It changed crucial elements in the character's past for no good reason. 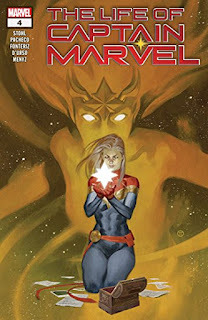 Unfortunately, the mini-series dedicated to The Life of Captain Marvel (meaning Carol Danvers) is looking like it's much more of the latter type of retcon. The last issue revealed a surprising secret about Carol's mother, and it just feels like fan fiction - where the creative team decided to make a major change to her backstory just because they could. It doesn't improve her character, or explain her motivations - it just churns the water and gives us an issue filled with exposition and tears. The series was presented as a re-telling (or perhaps a tidying up) of Captain Marvel's origin - but instead it just makes it even more complicated. Not a good retcon, I'm afraid. My feeling has always been that when the creative team have to "retell" a character's origin story, they've hit a dry spell. In comics, the job of the creative team is to move the character forward, hopefull in an interesting way. Sure, a reboot or retelling is needed every 10 years or so to keep the character fresh, but so often it seems like the storytellers need to latch onto existing frameworks because they're incapable of creating original stories.